Females remain silver with bloack spots. Aquarium Notes I call them the gentle giants due to their non-aggressive nature. The females can be kept in the aquarium after the pair spawns. They get territorial only when spawning. Don’t keep with small fish, since they will eat them. Fossorochromis Rostratus is a species that is extensively digging in the sand, always in search of food and small crustaceans. Sifting throw all that sand, they stirrup a lot of debris, thus a lot of species like C.Moori and Placidochromis Mdoka are always preasant near them for a quick and easy snack. 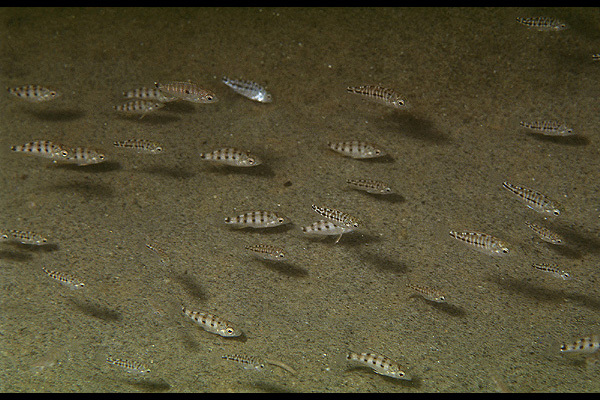 These are one of the bigger cichlids of Lake Malawi but do not get fooled, they are very peaceful; in fact, their name Sand Diver is a direct consequence of their nature. At the sight of danger, they DIVE in the sand, head first and burrow completely to avoid predators. It is an amazing spectacle that can be observed also in aquariums if given enough room. In the wild they can be observed in large numbers, a sign that they are a social species and even in aquariums will crave the presence of others from their kind. Males have a unique metallic color that is most unique to these species, and its an amazing show when they are in mating dress. Females are also excellent mothers and keep the fry well after they are big enough to swim. Special thanks go towards people that provided pictures and videos to make this article possible: AD Konings with his relentless research on African Cichlids.